Houses user-supplied batteries to extend runtime of a Tripp Lite SV-Series UPS. Tripp Lite's BP240V370NB consists of an empty battery cabinet that requires 40 user-supplied 12V 100Ah sealed lead acid batteries (CSB model GPL 121000 or equal). When populated with user-supplied batteries, this external backup battery pack extends runtime for SV-Series UPS systems. Up to three external battery pack cabinets may be connected in parallel to increase runtime. The BP240V370NB external UPS battery pack uses a +/- 120V DC configuration and must be hardwired to a compatible UPS. Circuit breakers provide overcurrent protection. The BP240V370NB is compatible with Tripp Lite UPS models that begin with SV20, SV40, SV60, SV80, SV100, SV120 and SV140. 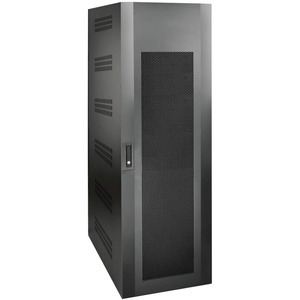 Made of powder-coated steel, the battery cabinet is designed to match the SV-Series UPS systems to keep a consistent look in your server room or data center. The cabinet door is lockable to control access to batteries. The top of the cabinet has conduit knockouts for user-supplied power output cables. Front and rear vents allow the free flow of warm air out of the cabinet. The BP240V370NB complies with the Federal Trade Agreements Act (TAA) for GSA Schedule purchases.